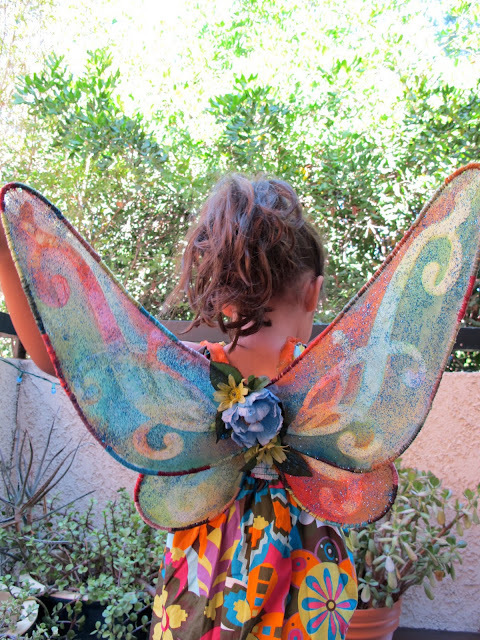 Holly loves her fairy wings. She wears them almost every day. She had some large wings that originally came with a Tinkerbell costume that were looking pretty sad. They started out pretty and white and were now torn and grey. I thought about throwing them out, but then decided to see if I could rescue them by painting them like we did with the princess dress rescue project. First, I had to stitch up the torn tips of the wings, so I decided to use embroidery floss to bind around all of the edges. 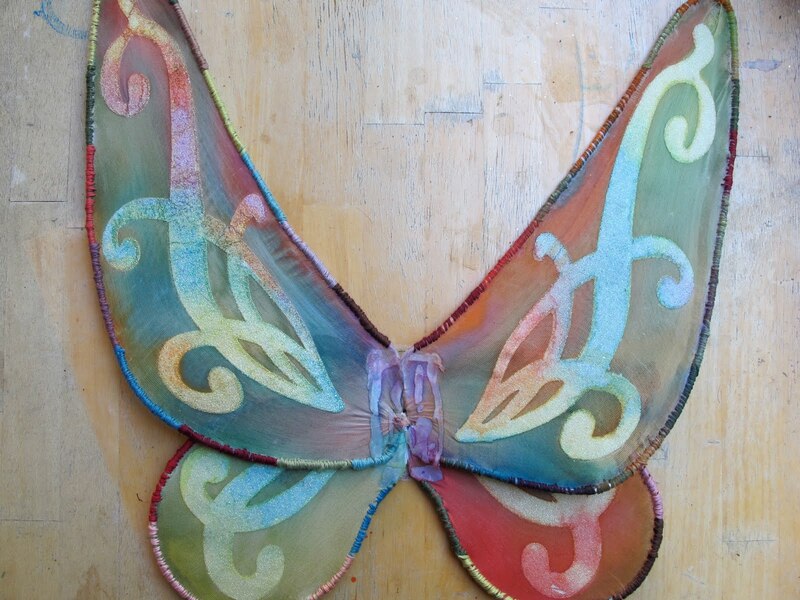 I used lots of different greens, reds, and blues to hide the stains on the old wings. 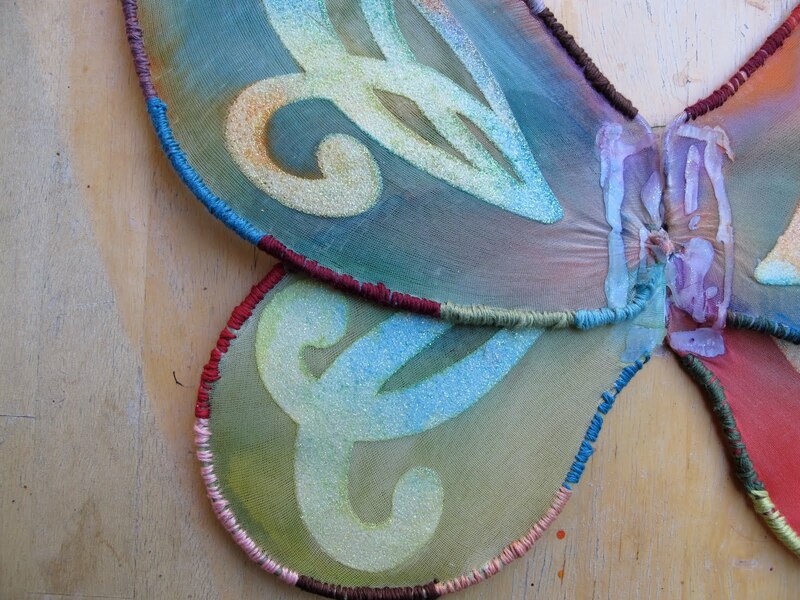 When I had stitched around all of the edges, I used diluted acrylic paint to color the wings. This was extremely messy because you are essentially painting pantyhose material, but when it dried they looked really pretty. I peeled off the little decoration that used to be in the center of the wings and threw it away so that I could use hot glue and put some silk flowers there instead. FABULOUS MUCH? Geez-O-Pete these are awesome! Cant tell you how many times I have made fairy costumes and just get some cheapy wings that shred to bits in no time...now the wings will be colored, spangled, and DURABLE. Love it! Thanks for the inspiration!